One of our most popular items! There is nothing more aggravating than losing one of your favorite earrings. Hook style earwires often push out of the ear when you wear scarves, turtle neck shirts or collared shirts. Never loose an earring again with this inexpensive and easy solution. E28 plastic earwire stoppers or clutches are flexible enough to slip onto a curved earwire and wiggle into place just behind the earlobe. These stoppers are made from PVC so they have enough friction to stay in place on the earwire for the whole day. 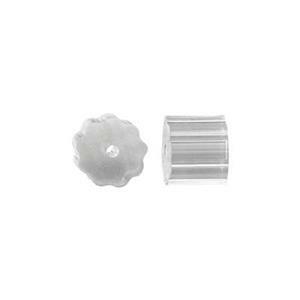 Many jewelers provide these stoppers with every pair of earrings they sell. Customers love them and appreciate the solution to the common lost earring problem.